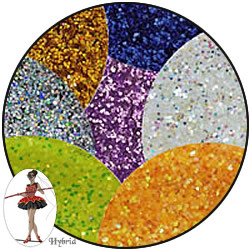 Bulk Glitters - Hybrid Glitters By Glitter My World! 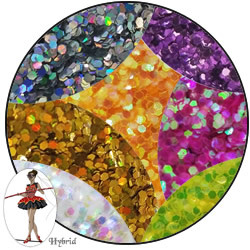 Hybrid is a new type of glitter that will be especially appealing to crafters, and also fine artists that paint with glitter. It is a glitter that is made from polyester film but is coated with craft glitter colorants and epoxy coatings. Why do this? The polyester film is thin and produces a glitter that sparkles much more than traditional craft glitter. The inexpensive colorants and coatings bring the cost way down which is terrific! Drawbacks... lower UV resistance, not solvent resistant. It is still an indoor glitter and not made for industrial applications. It has passed many tests with various brands of epoxy. Hybrid Glitters in an ultra fine .008 hex flake. Small jars to bulk. 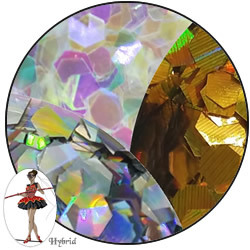 Hybrid Glitters in a fine .015 hex flake. Small jars to bulk. Hybrid Glitters in a chunky .040 hex flake. Small jars to bulk. 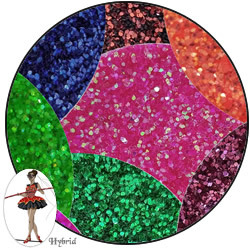 Hybrid Glitters in a jumbo .062 hex flake. Small jars to bulk.